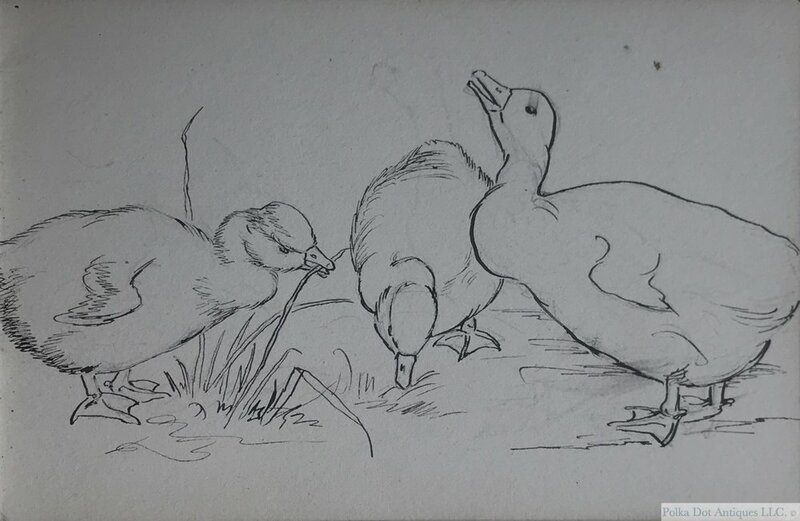 A Unique Hannah B. Barlow Sketch Book, 1895/6, dated “15th June, 95, H. B. Barlow, Rosendale Cottage, Wraysbury, with ink, watercolor and wash, drawing of sheep, horse, dogs, etc, many dated and signed, from 15th June 1895 to 26th May 1896. 7" x 5." There are some 48 sketches in all of which 16 have been illustrated below. The address on the inside of the front cover – Rosendale Cottage, Wraysbury, is were she lived after Fern Cottage, Wraysbury, in the early 1890s. There are some 42 illustrations in all of which 21 have been illustrated below. Florence E. Barlow Sketch Book. 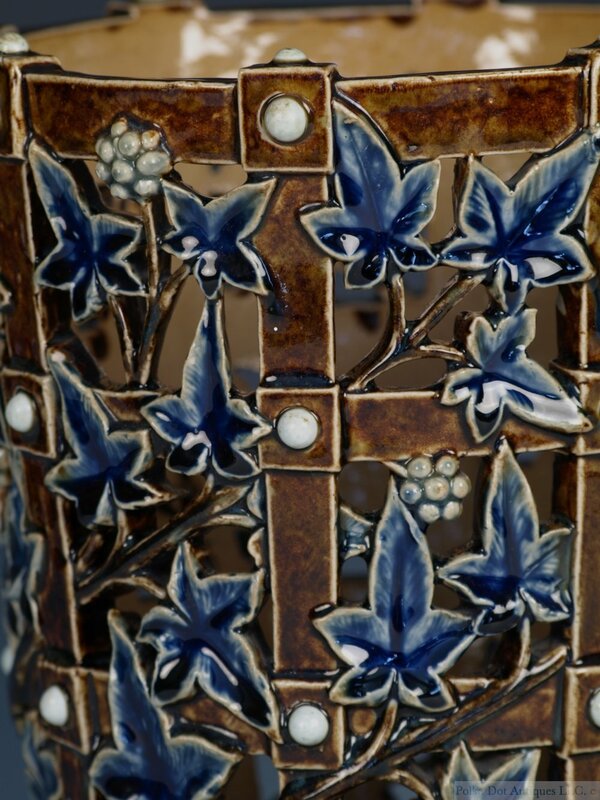 Tall Doulton Lambeth Stoneware Vase, 1891-1902, (Hannah B. Barlow), incised with a continuous panel of wild boar in a landscape divided by tube-lined Art Nouveau style flowers and foliage, on a mottle green glazed ground, impressed mark of a rosette and England, incised monograms, 26" high. Doulton Lambeth Salt Glazed Stoneware Vase with Lions, 1891-1902, by Hannah B. Barlow & Eliza Simmance, incised with a wide continuous band of a lion and lioness and the reverse with cubs, between thin molded stylized foliate bands, a scrolling foliate band above and overlapping lappet band below in blue and green, impressed rosette mark and ENGLAND, incised monograms H. B. B. & E. S., 17¼“ (44.5 cm). Royal Doulton Salt Glazed Stoneware Vase, 1902-1922, by Hannah B. Barlow and Florence C. Roberts, cylindrical body tapering to the base, incised with a band of horses and donkeys, between incised foliate bands on a pale green white ground, impressed factory marks, incised H.B.B., and F.C.R., 11.“ Excellent condition. Doulton Lambeth Stoneware Vase by Hannah B Barlow, 1880-1891, ovoid body tapering to the base, incised with a band of horses and fouls grazing, between raised geometric bands and beaded lappet bands, with a flared wavy rim, in tones of blue and green, impressed factory rosette mark, incised monograms H.B.B., 7” high. Doulton Lambeth Stoneware Silver Mounted Beaker by Hannah B Barlow, 1881, incised with a band of horses trotting, between raised cog bands and lappet bands, Impressed factory marks, incised monograms, H.B.B., silver makers mark, H.S. & H. (unidentified), Birmingham, 1881, 5¼“ high. Minor chips to raised cogs. 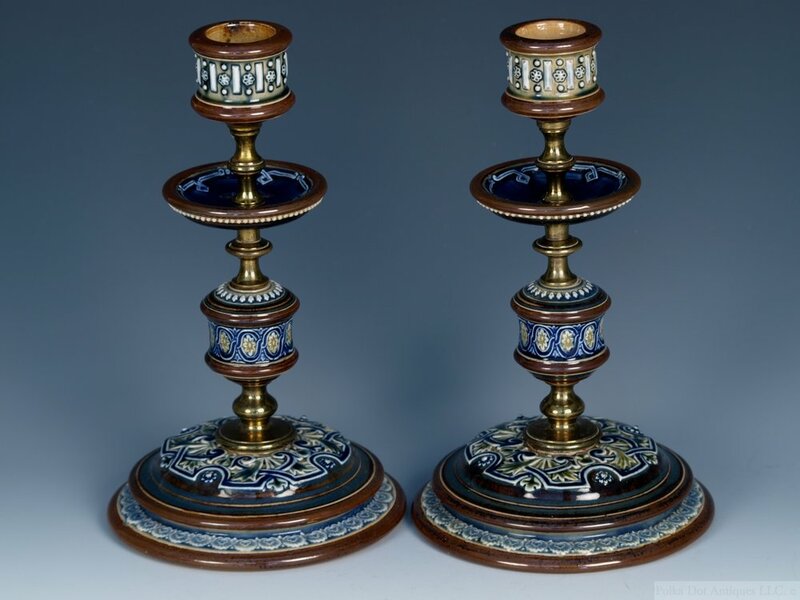 Doulton Lambeth Stoneware Jardiniere and Stand, 1879, by Emily J. Partington, of cylindrical form tapering to the base, with reticulated trellis sides with berries and vine leaves, the circular base with three flower heads in sections, impressed circular factory mark, 1877 on the base 1879 on the jardiniere, incised monograms, 9½“. Several minor chips. Rare Doulton Lambeth Faience Tile, 1880s, Kathy Smallwood, hand painted with a Medieval hunting scene, black painted monogram, 9” square. Royal Doulton ‘Sung’ Flambé Slender Vase, 1920s, by Harry Nixon and Charles J. Noke, printed factory mark, painted, Noke, N.H. monogram, Sung, 11½” high. Excellent Condition. 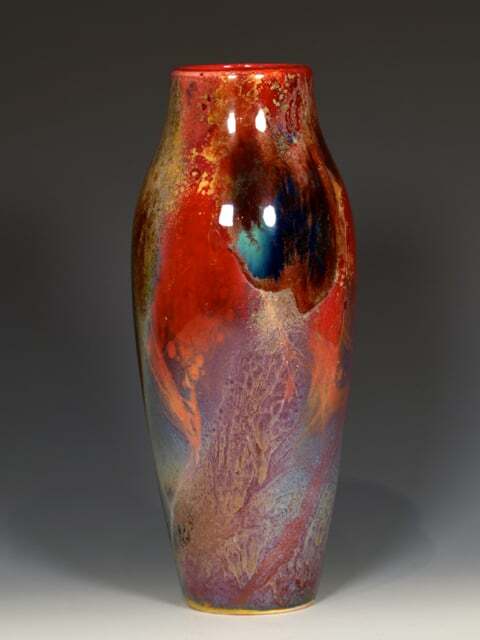 Unique Harry Nixon ‘Persian’ Ware Faience Vase, 1912, hand thrown and painted red hand painted signature, H. Nixon, 1912, 11½” high.